The Witches Ladder is a very old method of casting a spell. Three ribbons, cords, or ropes are braided together; you “weave” the magick into the ribbons using your magickal intention. Tokens that correspond to your spell’s purpose such as charms, beads, feathers, twigs, flowers etc. are woven in, during the braiding process. - Three lengths of ribbon, rope, twine, etc. 3 to 9 feet in length. Choose colors that correspond to your intention. You may use the same color for all three ribbons, or you may use different colors depending on your purpose. 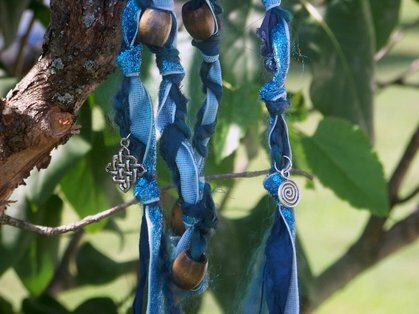 - Tokens to braid into your Witches Ladder that correspond to your intention. Purify and consecrate all items before you begin. Take time to firmly fix your goal in your mind. Be sure to see the goal as accomplished otherwise all the magick will flow towards perpetually trying to obtain, rather you’re your finished goal. For instance, if you are casting a spell to increase your wealth, be sure to “see” the money in your pocket ready to be spent, rather than “seeing” the money as something you wish you could get or that is coming towards you. Tie your 3 ribbons together at the top, and then make a loop. The knot will bind your intention, so be sure to strongly focus on your goal. Begin weaving, adding charms or tokens. Beads, or anything with a hole or bail may be strung on the ribbon either directly or by attaching wire or embroidery thread before adding them. Feathers, twigs, flowers etc. can be placed horizontally and woven in. We are weaving the world tonight. Hang your Witches Ladder in a place where it can do its work. Once your goal has been obtained, bury it in the earth, burn it, or throw it into moving water to release the magick spell.